channels with the hashtag #GoTourNY for a chance to win a weekly or monthly prize. 1000 ISLANDS, N.Y. - This summer, the Adirondacks, and 1000 Islands will echo with the roar of motorcyclists from around the country as they gather for events showcasing the unique attractions and scenic routes of Northern New York. The Adirondacks and 1000 Islands offer some of the most scenic and immaculate roadways in the state, traveling along historic corridors while providing access to motorcycle rallies and events. Download free tank maps, find event details and tips for where to ride at www.GoTourNY.com, then head to the Lake George Area on May 30, for the week-long Warrensburg Bike Rally, held at the Warren County Fairgrounds in Warrensburg. Wilmington, N.Y. - With a mix of road bike, mountain bike, uphill, downhill, serious competition and family fun, the annual Wilmington Whiteface Bike Fest is set for June 5 - 7, 2015. The weekend begins on Friday, when spectators will enjoy incredible stunts, jumps and tricks at the Wilmington Bike Park as Krushers Stunt Team, from Montreal, Quebec, return for the free jump jam and trials exhibition. Other events Friday evening include Sam Perkins and Carsinn Wilson performing bike acrobatics. Adirondack Region, N.Y. - The Adirondack Region is a growing mecca for mountain bikers in the Northeast, offering well-maintained trails, and a community of riders that welcomes visitors to explore and enjoy their favorite trails. Integral to maintaining Adirondack mountain bike trails are the volunteer organizations that do everything from securing funding for signage to raking leaves and pine needles off the trails. Barkeater Trails Alliance (BETA), a project of the Adirondack Ski Touring Council, is leading the charge around Lake Placid, Wilmington and Saranac Lake, adding on to existing networks so that all levels of riders have plenty of options. 1000 Islands, N.Y. - For motorcyclists, the 1000 Islands offer pristine roadways and untapped adventures featuring castles, historic waterways and smooth, winding roadways through state forests and parklands. This summer, plan a motorcycling adventure through the 1000 Islands Region for an immersive, one-of-a-kind getaway and explore dozens of pristine parks and unique heritage attractions, including two castles, historic towns and summer festivals. Greene County, N.Y. - The Great Northern Catskills of Greene County unveil a new self-guided discovery trail through the historic mountains and river valleys of literary fame and artistic acclaim: The Kaaterskill Clove Experience. The Kaaterskill Clove Experience provides visitors with renewed contextual access to the area&apos;s important historic sites, hiking trails and cultural attractions. Recognized for its scenic beauty, the Clove&apos;s landscape has inspired countless artists for generations, and the experience&apos;s stops represent key places in American history. Irish Eyes Love Orange County, N.Y.
Hudson Valley/Orange County, N.Y. - The leprechauns have put together a great collection of Irish events in Orange County, a true pot of gold at the end of the rainbow! Great Irish entertainment starts at Sugar Loaf Performing Arts Center on March 4 at 7:30pm when "Rhythm of the Dance" takes to the stage. The National Dance Company of Ireland, featuring The Young Irish Tenors, will amaze you with their dazzling steps, original and classic Irish songs, and magical and mystical dancing. Greene County, N.Y. - The Great Northern Catskills of Greene come alive during the holidays, offering a storybook setting ideal for a weekend ski trip to Hunter or Windham Mountains, and other memorable getaways with friends and family. •	Tannersville Annual Holiday Craft Fair & Spirits of the Holidays - On November 29, the "Painted Village in the Sky" will host their annual holiday festival and craft fair from 10 am to 4 pm at locations throughout the village. Visit with Santa, Frosty the Snowman and Sparky the Fire Dog, mail a wish list to the North Pole and watch the tree lighting at 5 pm. Canandaigua, N.Y. - Mother Nature has made herself known over the past week and Bristol Mountain has taken advantage of the earlier than normal frigid temperatures to get a jump on snowmaking operations. With one of the earliest start dates in their history, Bristol Mountain will kick off their 51st season today, Thursday, November 20th. The earliest opening date on record was November 9, 1991. Last year the season began on November 26th and ran for 134 days. "We couldn&apos;t be happier", says spokesperson, Drew Broderick. "Our snowmaking team has been working very since last Friday night when they started up the snowguns. 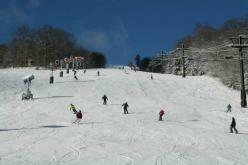 The very low temperatures have been perfect for snowmaking."